Since 1996 we have performed water and ground control projects all over North America. Our equipment is designed to be portable and easily transported. If I want to do the job myself, do you have polyurethane grout for sale? Sub-Technical is a contracting business and does not sell polyurethane grout. However; our subsidiary, SealGuard Inc. has a full line of polyurethanes available. Comprehensive training from Sub-Technical in their use is available. Can Sub-Technical respond to emergencies? Yes, our phone answers 24 hours a day, 7 days a week, 365 days per year - In most cases we can mobilize and be en route to your emergency within hours. How much water can you stop? 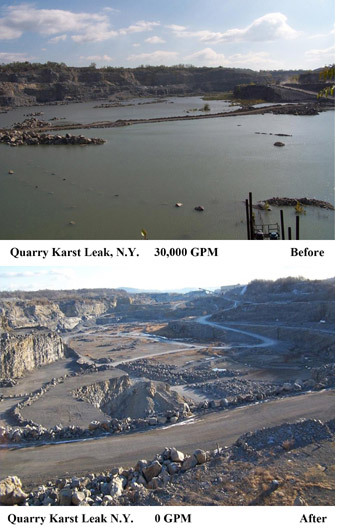 This was the result of in excess of 50,000 gallons per minute of infiltration through a Karstic formation into an open pit limestone mine. Are your technicians trained to work in mining situations? Yes - all of our technicians are fully trained, licensed and insured to 5000-23 standards. What is your MSHA ID? Can you help control Acid Mine Drainage? Yes, we are experts in this field. 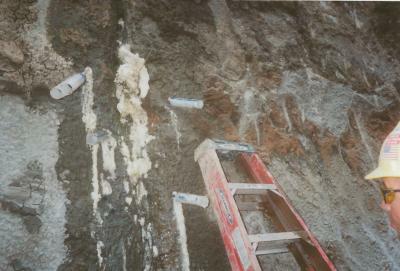 We can grout stream beds, impoundments, seal mines and/or shafts, support long walls or eliminate Karstic anomalies. Can HyperFlex be used to fix leaking mine ventilation seals? Yes, HyperFlex is an ideal solution, it does not fracture the cleat, is expansive and flexible, allowing for movement and settling of the surrounding rock strata. Does the presence of salt water - as in coastal area - affect the ability of your materials to react? No, our products react and cure normally in the presence of salt water. Do your customers have to supply any equipment, or does Sub-Tech supply everything necessary? That is up to the customer. Some cost savings can be realized if, for example, the customer supplies an air compressor or drill rig that they may already have on site. However, if necessary, Sub-Tech has all the equipment we need to do any job. Can Sub-Tech supply customized urethane blends for specific needs such as non-flammability? Yes, we have on site blending capabilities including a Talon 650 gallon vacuum reactor vessel with a high shear mixer.